Bowness, Ambleside and Windermere are great places to visit whilst holidaying in the Lakes, they provide a welcoming environment as a base for your stay. However, for the first time hiker, walking can be a little thin on the ground (no pun intended) and maybe you lack a bit of confidence in finding your way around a Cumbrian fell or negotiating footpaths? Well I would like to tell you about a neat little bridleway that is situated on the western shore of Lake Windermere, which might seem like a different world when looking at it from Bowness, but I assure you come rain or shine the bridleway is a fantastic introduction to hiking and the transport links to and from it run regularly and like clockwork. This flat 4 mile walk starts at Ferry house, just under the shadow of the currently in development Claife Viewing station. Viewed as the London Eye of it's day, it was built in 1799, and was the destination for the earliest tourists to the Lake District who would admire the very best view of the Lake through different coloured glass windows. It was deemed as a 'adventurous' place to visit as it took visitors out of their comfort zone and took them to an area that was seemingly inaccessible. To reach the western shore of the lake, you can board a ferry from either Bowness; Ambleside or Brockhole which will take you down to Ferry House. At this point I reccomend a quick toilet break before setting off on your adventure. From the toilets and keeping the Lake on your right at all times, follow the road for apx 100metres until you get to a footpath through a gate. Follow this path to a quiet lakeside road and turn right, and quite literally follow your nose. Eventually the road becomes a track (bridleway) and you just keep heading north for apx 4 miles where you will see finger posts for Wray Castle. By this point you will have worked up a thirst, so nip into the Cafe at Wray Castle for a well earned brew and cake. Your ferry home can be boarded from the jetty at Wray Castle and you'll have one of the best nights sleep you've had for a long time. It really is that simple! The views are spectacular along the path, especially at Red Nab and if you don't fancy doing the full route, you can catch a ferry back from Bark Barn which will shorten your journey by one mile. It's also worth noting that with this path being a bridleway, you can use your bikes. Windermere cruises provide a bike service. Look at the map attached to alter your route accordingly. Good luck and enjoy your visit, and if you see any of our Rangers (usually in red) be sure to say hello. John Muir was born on April 21, 1838 in Dunbar Scotland. He immigrated with his family at the age of 11 to Wisconsin in the United States. John would walk the fields and woods of the Wisconsin countryside, where he became more and more enchanted with the natural world. In 1860 he enrolled at Wisconsin University, where he got good grades but after 3 years left to travel. In 1867 Muir suffered a blinding eye injury, which would change his life. When he eventually regained his sight, he devoted his life to the Natural world. John turned more seriously to writing, publishing 300 articles and 10 major books that recounted his travels, expounded his naturalist philosophy, and beckoned everyone to "Climb the mountains and get their good tidings." Muir's love of the mountains gave his writings a spiritual quality and his readers were inspired and often moved to action by the enthusiasm of Muir's own unbounded love of nature. In one particular article, Muir drew attention to the devastation of mountain meadows and forests by sheep and cattle and as a result worked to remedy this destruction. In 1890, due in large part to the efforts of Muir, an act of Congress created Yosemite National Park. Muir was also personally involved in the creation of Sequoia, Mount Rainier, Petrified Forest and Grand Canyon national parks. In 1892, Muir and a number of his supporters founded the Sierra Club, the USA’s largest environmental organisation to protect the newly created national parks. John Muir died on December 24, 1914 from pneumonia aged 76 but his legacy taught not only the people of his time but ours the importance of experiencing and protecting our natural heritage. The John Muir Award was launched in 1997 and is an environmental award that encourages people of all backgrounds to connect, enjoy and care for wild places. 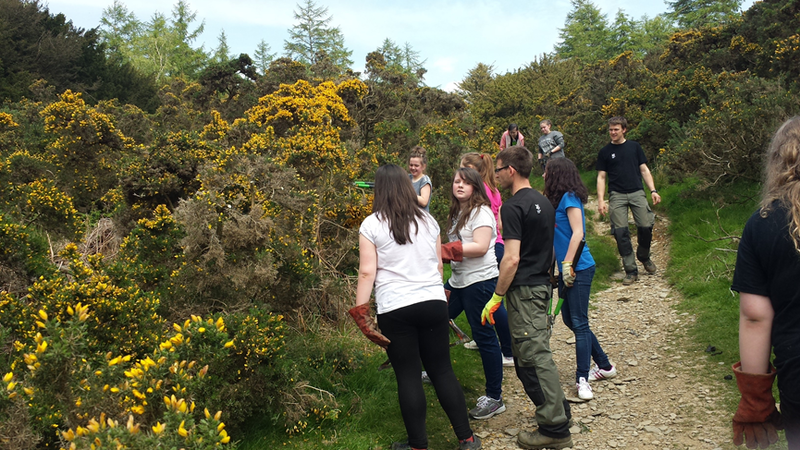 As part of the conservation challenge of the award, we were joined by year 9 students from John Ruskin School to help clear gorse from one of the rights of way. The gorse had become so overgrown in places that the path was becoming impassable. With the help from the two groups that undertook the task, the area is looking much better and we’ve had a great response from walkers using the path and how good it was to see young people getting out and making a difference in countryside. Refreshing comments if I may say so myself. Students assessing where to start? Gorse (Ulex europaeus) is a member of the pea family and can be found in all kinds of habitats from heaths and commons to towns and gardens. It generally flowers from January to June. Gorse is a large, evergreen shrub covered in needle-like leaves and distinctive, coconut-perfumed, yellow flowers during the spring and summer. Gorse is an important shrub as it provides shelter and food for many insects and birds, such as Dartford Warblers, Stonechats and Yellowhammers. Gorse however, can quickly become invasive in an area, forming dense, impenetrable stands if not managed. 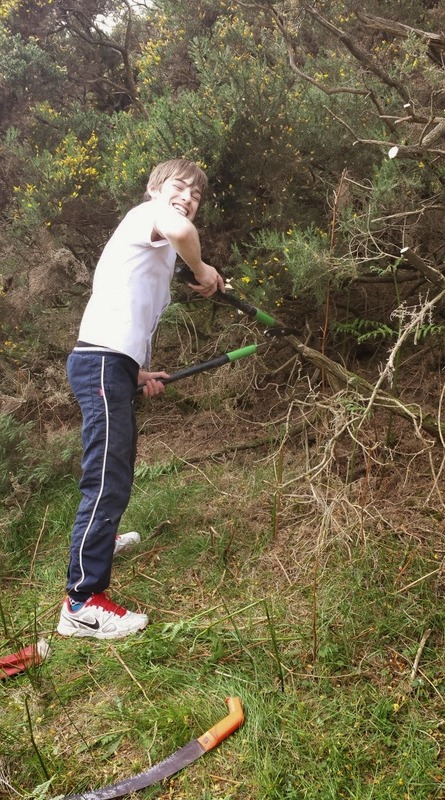 We have planned several other days with the School, with task to remove the never ending amount of rhododendron in some of our woodlands. “Fresh beauty opens one's eyes wherever it is really seen, but the very abundance and completeness of the common beauty that besets our steps prevents its being absorbed and appreciated. It is a good thing, therefore, to make short excursions now and then to the bottom of the sea among dulse and coral, or up among the clouds on mountain-tops, or in balloons, or even to creep like worms into dark holes and caverns underground, not only to learn something of what is going on in those out-of-the-way places, but to see better what the sun sees on our return to common everyday beauty." Fix the Fells has 14 Upland Rangers across the Lakes, between us we look after many of the access routes into the fells. As of April 2012, according to the Lake District National Park Authority there are 1913 miles of rights of way in the Lakes. If that was laid out end to end it that would get you from Lands End to John O'Groats AND back again with a bit to spare! So it's a fair old do looking after it all and the upland routes can be the most challenging but inspiring to work on. Take our current project on Striding Edge for example, that's a pretty special office in my eyes and a real privilege to have the opportunity to work on it. Yet there is something that niggles me here..... Where on earth am I meant to pee?! Now I'm no stranger to wild wee-ing as 99% of my working life is spent outside, but sometimes I arrive onto my work sites and the concept of baring my bum to the world really doesn't appeal. Striding Edge is one of these places. If it's not the steep drop either side of the edge, it's the masses of people that go walking up there when the weather's good. Add the bright red ranger jumper and well I may as well declare to the world that I just gotta pee, because I've been holding it in since 7:20am and I won't get home til 5:30pm! You see, I do exactly the same as the guys do, yes including hauling around some pretty beefy rocks (no gym membership needed for me). Indeed on our current working holiday we have out with us I have earned myself the nickname 'rock whisperer'. I guess this comes from my manual handling technique. As I don't quite have the strength or bulk to move some stone I really rely on technique, so it may look like I'm telling the rock to be light/move itself, but in reality I'm just trying to find the best balance point and easiest way to move stone without doing myself in. After all, footpath work is a marathon, not a sprint. Winches can also be helpful with big rocks! As the only female upland ranger I also currently hold the "Our Woman At The Top" crown/tiara for Heart of the Lakes, other teams have a 'Man at the Top' for other business. This is one of Fix the Fells fundraising methods, whereby anyone who books a holiday cottage with Heart of the Lakes has the option to tick a little box that donates two pounds towards Fix the Fells, a great way for visitors to the Lakes to give something back, so if you've ever ticked that box - thanks! I must say I do feel a great sense of pride to be doing the job I do and to work with the team that I do. We all share a great respect and love for the mountains in which we work. As offices go it can be as inspiring as it is exhausting, somehow stunning in the sunshine or pouring rain and forever challenging and changing. And although I may be the only full time female worker, we have many female Fix the Fells volunteers who regularly go out on drain runs and work parties. Together us guys and gals, staff and volunteers work together to protect these mountains that so many of us enjoy. So when you're next out on the fell and you see a collection of workers digging away come and say hello, and if you see a wee lass on site, make her day by saying "good job boys AND girls", trust me, it's a small gesture that goes a long way! If you are interested in the work Fix the Fells does we have a volunteer day in Langdale on 8th June, everyone welcome, click here for more info! There are lots of signs of spring around at the moment such as swallows returning to the skies above the volunteer centre and great swathes of bluebells in the woods. Unfortunately there's also the return of wasps looking for a place to build a nest, which gives us an unpleasant dilema. Wasps build amazingly intricate structures for their nests, which they make from a paper like substance they produce by chewing wood and mixing it with saliva. If you ever see a wasp on fence or shed around this time of year and aren't too nervous, get a little closer and you may be able to hear it scaping wood off. Not just on wood either - this nest was appearing in our metal tool store! Initially, it's just the queen building a small nest to lay a few eggs in. When these hatch, they are sterile females that quickly build a larger nest around the queen as their numbers increase. It's this point that we need to avoid. Here at High Wray volunteer centre we have a number of tempting buildings that wasps really like to build nests on. The thing is, they're all buildings that we and anyone else staying here need to access (boot store, tool store, drying room etc) so we can't really have a giant wasp nest in there as well. Hence the wasp patrol. This time of year we take regular patrols round our outbuildings and knock off the nascent nests before they get a chance to get established. A few goes at this and the queen gets discouraged and goes somewhere else, meaning we've hopefully not caused too much harm to these much maligned creatures. It's not a nice thing to have to do, but hopefully the queen will find herself a nice quiet spot to make her home and Basecamp volunteers can get on with their day in peace!